Why start from scratch on every job when you can have an entire library of creative DXF files ready for use! Your included electronic DXF Clipart book is a PDF image guide that will allow you to locate the DXF file image that you want then direct you to the name of the file folder where you can import it. Simply locate the image you want, then browse to the appropriate file and you're ready to work! Over 6000 DXF Files, covering 36 different categories! 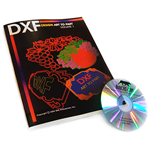 The DXF Clipart book and files are all electronic and can be accessed right after purchase. This is just the digital download only. If you would like a hard copy of the book and and cd please purchase then please purchase the booklet version for $199.